A China/US Pacific War is a very real possibility-as early as later this year according to some US based China experts. In a hypothetical future scenario, the U.S. and China are poised to clash — likely over Taiwan. The democratic Republic of China, commonly called Taiwan — which America backs and the communist People’s Republic of China considers part of its territory — frequently irritates Chinese leaders with calls for greater independence from the mainland. 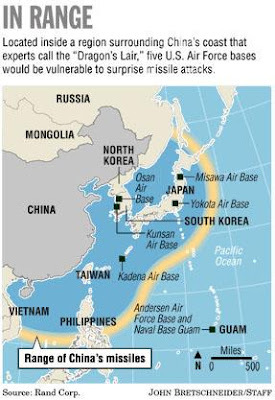 But while the American military mulls its options, Chinese missiles hit runways, fuel lines, barracks and supply depots at U.S. Air Force bases in Japan and South Korea. Long-range warheads destroy American satellites, crippling Air Force surveillance and communication networks. A nuclear fireball erupts high above the Pacific Ocean, ionizing the atmosphere and scrambling radars and radio feeds. This is China’s anti-U.S. sucker punch strategy. It’s designed to strike America’s military suddenly, stunning and stalling the Air Force more than any other service. In a script written by Chinese military officers and defense analysts, a bruised U.S. military, beholden to a sheepish American public, puts up a small fight before slinking off to avoid full-on war. This strategic outlook isn’t hidden in secret Chinese documents. It’s printed in China’s military journals and textbooks. And for much of last year, Mandarin literates and defense experts — working for the Santa Monica, Calif.-based Rand Corp. on an Air Force contract — combed through a range of Chinese military sources. They emerged with “Entering the Dragon’s Lair,” a lengthy report on how the Chinese People’s Liberation Army would likely confront the U.S. military and how the Air Force in particular can brace itself. In many cases, the theoretical enemy nation China’s officers discuss in these scenarios isn’t explicitly named but is unmistakably the U.S. When it comes to conflict with the U.S., Chinese military analysts favor age-old schoolyard wisdom: Throw the first punch and hit hard. China’s experts concede its army would lose a head-on fight, with one senior colonel comparing such a scenario to “throwing an egg against a rock.” Instead, the Chinese would attempt what Rand calls an “anti-access” strategy: slowing the deployment of U.S. forces to the Pacific theater, damaging operations within the region and forcing the U.S. to fight from a distance. “Taking the enemy by surprise,” one Chinese military expert wrote, “would catch it unprepared and cause confusion within and huge psychological pressure on the enemy and help [China] win relatively large victories at relatively small costs.” Another military volume suggests feigning a large-scale military training exercise to conceal the attack’s buildup. Striking U.S. air bases — specifically command-and-control facilities, aircraft hangars and surface-to-air missile launchers — would be China’s first priority if a conflict arose, according to Rand’s report. U.S. facilities in South Korea and Japan, even far-south Okinawa, sit within what Rand calls the “Dragon’s Lair”: a swath of land and sea along China’s coast. This is an area reachable by cruise missiles, jet-borne precision bombs and local covert operatives. Air Force bases within this area include Osan and Kunsan in South Korea, as well as Misawa, Yokota and Kadena in Japan. And in a conflict over Taiwan, any nation allowing “an intervening superpower” such as the U.S. to operate inside its territory can expect a Chinese attack, according to China’s defense experts. China is designing ground-launched cruise missiles capable of nailing targets more than 900 miles away — well within striking range of South Korea and much of Japan, according to the report. Cruise missiles able to reach Okinawa — home to Kadena Air Base — are in development. The Chinese would first launch “concentrated and unexpected” attacks on tarmacs using runway-penetrating missiles and, soon after, would target U.S. aircraft. Saboteurs would play a role in reconnaissance, harassing operations and even “assassinating key personnel,” according to another military expert. Chinese fighter jets would scramble to intercept aerial refueling tankers and cargo planes sent to shuttle in fuel, munitions, supplies or troops. High-explosive cluster bombs would target pilot quarters and other personnel buildings. Because the American public is “abnormally sensitive” about military casualties, according to an article in China’s Liberation Army Daily, killing U.S. airmen or other personnel would spark a “domestic anti-war cry” on the home front and possibly force early withdrawal of U.S. forces. (“The U.S. experience in Somalia is usually cited in support of this assertion,” according to the Rand report.) Once this hard-and-fast assault on U.S. bases commenced, the Chinese army would “swiftly divert” its forces and “guard vigilantly against enemy retaliation,” according to a Chinese expert. Losing early-warning systems designed to detect incoming missiles would be, for the Air Force, the most devastating setback — one that could force the service to exit the region altogether, according to Rand. China could also launch a nuclear “e-bomb,” or electromagnetic explosive, that would fry U.S. communication equipment while ionizing the atmosphere for minutes to hours, according to the report. This would likely jam radio signals in a 900-mile diameter beneath the nuclear fireball. The PLA could also employ long-range anti-satellite missiles — similar to one successfully tested last January — to destroy one or more American satellites. However, the PLA has a host of less dramatic options: short-range jammers hidden in suitcases or bombs and virus attacks on Air Force computer networks. Shielding against a swift Chinese onslaught is, according to Rand, as simple as reinforcing a runway or as complex as cloaking the orbit of military satellites. In the short term, U.S. air bases inside the Dragon’s Lair should add an extra layer of concrete to their runways and bury fuel tanks underground. All aircraft, the report said, should be parked in hardened shelters, especially fighter jets. Parking larger aircraft — bombers, tankers and E-3 Sentry Airborne Warning and Control Systems jets — in hard-shell hangars would be expensive and difficult but likely worth the cost, according to the report. U.S. fighter jets remain the best defense against incoming Chinese missile attacks. But, given China’s taste for sudden attacks, surface-launched missile defense systems must be installed long before a conflict roils. Because the PLA is expected to strike quickly, the report said, waiting for the first tremors of conflict is not an option. The Air Force also should fortify itself against Chinese hackers by using software encryption, isolating critical computer systems and preparing contingency plans to communicate without a high-bandwidth network. Though China maintains a “no first use” nuclear bomb policy, the U.S., according to Rand, should warn China that nuclear electromagnetic pulse attacks will be considered acts of nuclear aggression and could prompt nuclear retaliation. Rand insists the Air Force must defend satellites — which support communication, reconnaissance, bomb guidance and more — against China’s proven satellite-killing missiles. This could be accomplished in the Cold War tradition of mutually assured destruction by threatening to retaliate in kind if the PLA blasts U.S. satellites. Or, Rand suggests, the U.S. could invest heavily in satellite protection or evasion techniques, including stealth, blending in with other satellite constellations or perhaps developing and deploying microsatellites capable of swarming to defend larger satellites, which the Defense Advanced Research Projects Agency is working toward. Could this really happen? The Chinese first-strike strategy is “more than hypothetical,” according to the report. But in the near term, at least, it’s considered unlikely. The anzus alliance would have helped in such a scenario by providing local outposts for allied forces. Labour has destroyed our ability to fight communist expansion. shameful. Chiang Kai Chek's old KMT party once supported the rise of Chinese Communists in China with the rise of Sun Yat-sen. Even despite the "differences" between Chinese Nationalists whom I have often consider as proto-Communists, not really anti-Communists have reversed much of their so-called anti-Communist leanings into favoring Taiwan to become a province of Communist China. Militaries are always coming up with war strategies. Once upon a time the USA even comissioned a plan on how to invade New Zealand. China invading Taiwan would be catastrophic for them. They are in no hurry. Imagine the uproar if China were to establish five military bases off the coast of the U.S.
"Imagine the uproar if China were to establish five military bases off the coast of the U.S."
Apparently, someone like you anonymous could care less about an obvious totalitarian growing super power like that of Communist China which its known established Communist leader-Mao Zedong is arguable one of the worse mass murderers in modern history. You apparently don't give a damn about security in the Pacific. You're just simply grovling to a totalitarian power like China. I put forth a solution so that the U.S. won't be economically dependent and that's going high-tech and relying on robotic technology to be more economically independent. But I'm pretty sure you're against this idea to be implemented in whatever nation you live in. Just remember that when you hear reports of various human rights abuse thanks to the Butchers of Beijing. who's supporting iran, zimbabwe, groups bombing in nepal, india? Of course selling arms to cuba and venuzuela isn't putting military bases off the coast of the US. Taiwans recent history isn't spotless nor is NZ's, however they seem to be heading in the right direction where we are suppressing free speech, collectivising property etc. Makes one wonder if trade agreements with china spread capitalism or support communism. There is a saying, "No battle plan survives contact with the enemy". Anonymous said "Once upon a time the USA even comissioned a plan on how to invade New Zealand." Once upon a time? You can be sure that the US has more than one set of plans for invading NZ. The analysts at the War College wouldn't be doing their jobs if they didn't have such a plan. I'm sure the Russians, Chinese, Indonesians, Australians and probably others also have such plans. I have read that the War College maintains 3,000 war plans that are continuosly reanalyzed and updated. Taiwans recent history isn't spotless nor is NZ's, however they seem to be heading in the right direction where we are suppressing free speech, collectivising property etc. Makes one wonder if trade agreements with china spread capitalism or support communism." Anonymous, please stop your shilling for a totalitarian power like Communist China. If the West gets smart and goes into high-tech Capitalism, perhaps Western nations like the U.S., Britain and others won't have to rely on a totalitarian power to be kept economically upfloat. Going high-tech would also solve the problem of the influx of illegal immigration. Illegals who are still within the country of a Western nation would have to come to a choice into being assimilated and also get educated so that they won't be with jobs that high-tech robots would likely take over. Their old homeland governments such as Mexico or other Middle Eastern nations should have the duty to now concentrate for their concerns of the needs of their people. Not bash the West for their old bleak history with each other. In the case of why the Mexican government supports illegal immigration (if it hurts the U.S.), the Mexican government should concentrate on educating its people instead of not pushing its poor population out. The same goes for other nations with similar policies. All these are nonsense. Who is the one say Iraq got Weapon of Mass Destruction ? Any then anything found ? Who is the one that say Iran is developing Nuclear Weapon and then ? And now, who is the one say China is going to attack USA. Only a fool will believe that. Please use your common sense. It seems that only a very few got common sense. Alot of fool believe in this story. China already got too many problems. They are busy solving their unemployment problems, pollution problems, rural problems, etc. China will never attack USA. The media should be more responsible and not create "story" to mislead the public. Period. For someone who has the screen name "common sense", you really don't seem to give a damn about China being controlled by the overtly totalitarian ruling Communist Party of China. You don't seem to get it do you? You're nothing more than a simple shill for the West's enemies. You folks really need to sort out your collectivist mentalities, there's no such thing as "the West". You folks really need to sort out your collectivist mentalities, there's no such thing as "the West"." And yet we have another shill for a growing totalitarian power like Communist China. Lefties like you are right up the same alleyway as the so-called Western unpatriotic "Capitalists" who rely to kept economically dependent on the growing totalitarian power. I guess the so-called "Capitalist" Elites and people like you have more in common than once thought. Oh the irony of Leftist radicals agreeing with folks like Richard Nixon, Kissinger, the very unpatriotic "Capitalists" who first allowed the U.S. and other Western nations to be handicapped by being economically dependent on a totalitarian power. This is a sounding revealation right here. Who are all these leftist radicals who agree with Nixon and Co? Are they real people or some sort of shadowy figures from the recesses of your imagination? "Who are all these leftist radicals who agree with Nixon and Co? Are they real people or some sort of shadowy figures from the recesses of your imagination?" People like you who deny the threat of a growing totalitarian power like Communist China. That's who. Actually I consider the Chinese government to be viciously totalitarian, a nasty colonial power and very very dangerous. One of the most dangerous governments in the world, in fact. I'd like to see you try and find a single word I've ever said in support of the communist government of China, but I guess you are too busy with your wild imagination to engage with the real world. Uh, didn't you just say this message right here? What on earth in that comment is positive about Chinese communism? I was criticising 'western' leaders who are happy to deal with totalitarian governments, and pointing out that it's thus ridiculous to claim China is an enemy of 'the west' as these people, clearly part of 'the west', see China as a country to do business with rather than as an enemy. I'm sure the Chinese government feels the same. It might make some sense to say China, or at least, the Chinese government, is an enemy of many of it's own people, particularly Uigher and Tibetan ethnic groups, or an enemy of working class people that it oppresses at home and puts out of work abroad, but to claim it is the enemy of the entirety of 'the west' is absurd. "How about we display a map of all the places the US could surprise attack with its long range missiles? Oh wait, it would cover pretty much the entire planet..."
Knock it off you apologist to the Butchers of Beijing. Mah Mah I know that you lament in anticipation the soon to pass days of The Chickenhawk but do "knock it off" and "shut it" this "hmmm" and "certainly" apologist rubbish about "butchers". The last US person I knew who had a partiality for "butchers" was your supremely and arrogantly twisted but no longer perennial Rummy Rumsfeld.....schmoozing up to the Butcher of Baghdad.....selling him weapons of mass destruction no less. While the poor old Kurds looked on.....holding their collective nose.....in anticipation. Look what happened to Rummy.....mouldering away in some right-wing foundation's archives somewhere, getting madder and madder. The closest you should get to a "butcher" is a lump of kosher schnitzel my (sic) frend. I agree with Trevor and mah that the Communist Chinese are intrinsicly enemies of liberal democracies worldwide including NZ. But I believe the Mao Dynasty or Communist Dynasty (take your pick) will not last much longer. The communists have a capitalist tiger by the tail. The communists are one banking crisis away from joining the trash heap of history. Steve, China is a totalitarian government. Stop being such a shill here. I read a story of where a Chinese blogger was beaten to death by over 50 party members of the local chapter of the ruling party. You bash America, but then say nothing about this? How about China having Internet police such as "friendly" cartoon characters telling Chinese Internet users not to go to the "wrong" sort of website? That's suppose to tell me that China is free? How about Saddam Hussein? You keep on screaming on this Internet blog how "bad" America is to Iraq. But never give a damn about Saddam supporting Abu Nidal responsible for massacring Israelis with the Black September attack or him harboring the WTC 1993 bombing terrorists. I hate to burst your bubble. but capitalist Australia is trying to implement a filtered internet system as well. guess Australia must be totalitarian. similarly isn't it america who has been in the news recently about torturing suspected terrorists. also wasn't america who support Mujahideen in afghanistan. that worked out well for them. I am not saying that china in no way is a threat but as threats go it is fairly contained for now. it has few or no overseas base from which it can launch an attack. now be before i am painted a shill by mah29001 like everyone one else commenting. i believe the both america and china are a threat. they both have the ability to do great evil and good it just depends on which side of the fence you sit. THIS IS US MILITARY'S RESPONSE IF CHINA DO LAUNCHES THE FIRST STRIKE...SIMPLY RESPOND IN KIND WITH SUBMARINE LAUNCH TRIDENT NUCLEAR MISSILES AND STOP THE WAR WITH JUST ONE BLOW FOR GOOD.CHINA WILL BE AN EMPTY PLACE ON THE PLANET FOR A VERY VERY VERY VERY LONG TIME....HOWS THAT FOR A RESPONSE!! !